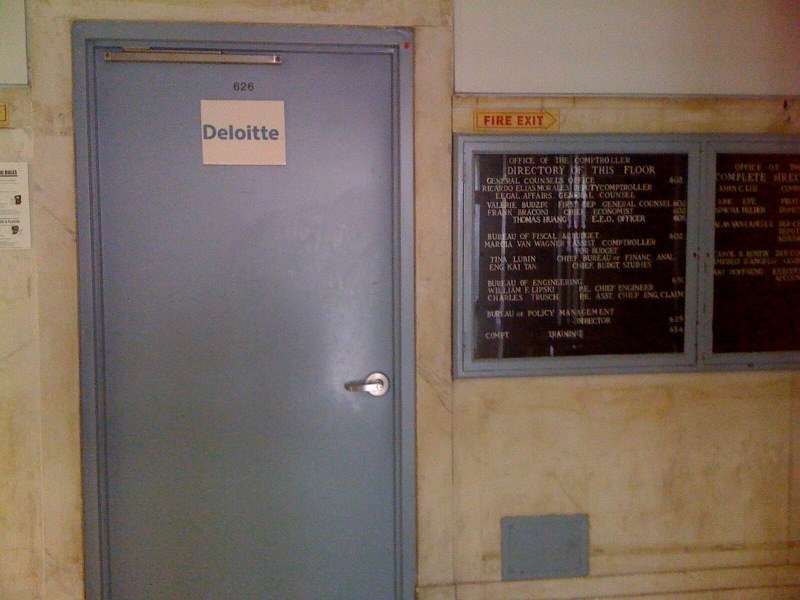 At the New York City Industrial Development Agency’s public hearing last week, two proposals generated notable controversy: one to bestow millions in tax breaks on Big Four accounting firm Deloitte LLP, and another to revive a subsidy agreement from 1998, still worth millions in unused credits, for information services giant Thomson Reuters. This past Tuesday, the IDA board approved both projects, but not before a handful of board members engaged in a robust dialogue with IDA staffers, especially on the Thomson Reuters proposal. The Deloitte proposal could have benefited from an even more vigorous discussion. For one thing, it smells like the same old game in which companies pit states and regions against each other in bidding wars for investment. As an IDA staffer explained, the agency “took seriously” a “threat” that Deloitte would leave the city for “other opportunities,” namely New Jersey. (Deloitte LLP plans to use the subsidy to help pay for moving its headquarters from one highly prized Manhattan office location—midtown—to another—Lower Manhattan.) And yet IDA staff also reassured the board that the proposal wasn’t about retention, but about growth. As EDC President Seth Pinsky stated, Deloitte will get no benefits until it increases its employment numbers within NYC. While bestowing benefits only after Deloitte has met job targets does represent some progress compared to, say, the Giuliani era, IDA board member Andrea Feirstein, representing Mayor Bloomberg, rightly voiced a concern that IDA have processes in place to “make sure that [Deloitte] is living up to their end of the deal.” Even so, none of those jobs have to be new; they are all expected to be relocated from nearby states like Connecticut, where Deloitte already has workers. (The same is also true in the case of the Thomson Reuters deal). It would have been worthwhile to hear at least some discussion on the wisdom of subsidizing thriving companies to basically shift resources from one part of the region to another, especially given that these places, like the rest of the country, are suffering from the economic crisis, too. Shouldn’t we be focusing on creating new jobs in the region as a whole? IDA staff also touted the benefits to the city of sales tax exemptions for equipment, though according to project materials, Deloitte and its subsidiaries “primarily make equipment and technology purchases on a national basis, based on pre-established national contracts.” None of the board members asked whether IDA could have encouraged Deloitte to support local manufacturers, a measure which would have made this proposal more palatable, both from an economic development and an environmental standpoint. Also absent was any debate over whether or how Deloitte’s millions of dollars in contracts with the city and state (including the city comptroller) should influence the final decision. Board member Carol Kostik, representing Comptroller John Liu, registered the single “no” vote on the subsidy package. Though it was a tougher sell, the board also approved the Thomson Reuters proposal, under which the firm will receive about half of the $10.7 million left over from the 1998 deal right away. (Under the earlier agreement, set prior to Reuters’ 2008 merger with the Thomson Corporation, Reuters never got all the money because it failed to meet job targets). Board member Albert Rodriguez, representing the Bronx Borough President, called bestowing benefits up front a “bad idea,” especially at a time when serious cuts are being made to social services for the city’s poorest residents. The remaining half of the $10.7 million would be made available to Thomson Reuters after it increases its citywide employment level from 3,744 to 3,977. Benefits would also be contingent upon the firm maintaining its headquarters in NYC, though IDA staff explained this wasn’t their main concern—it was more that, without incentives in place, the company might move back offices and support services out of the city. But if this is the case, then why not, as an alternative to subsidies, promote cheaper real estate options within the city, such as Downtown Brooklyn, which was rezoned in 2004 exactly for the purpose of staving off the movement of back office operations to New Jersey? The Thomson Reuters proposal had to overcome another hurdle: a dispute the company has with the Newspaper Guild of New York, which has filed an unfair labor practice charge with the National Labor Relations Board. The Guild is charging that Thomson Reuters unilaterally declared an impasse in contract negotiations, and imposed a set of pay cuts and new work rules. Guild members showed up in force at the board meeting, where board member Kevin Doyle, representing the Manhattan Borough President, brought their concerns into the deliberations. The board rejected two motions by Doyle—the first to delay the vote on the deal to give board members more time to get the facts straight regarding the labor dispute, and a second to amend the proposal to deny Thomson Reuters benefits if the NLRB decides to issue a complaint against the company. Even though the approval of these subsidy packages is disappointing, it’s encouraging that some board members are refusing to rubber stamp proposals from the staff and are raising key issues about subsidy accountability. It would be even better if these issues were taken into account by IDA staff in the first place, so that dubious deals do not even come up for a vote.